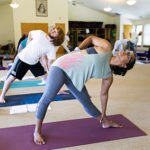 Lalita has been practicing Integral Yoga since 1998, and became an Integral Yoga instructor in 2005. Lalita is now certified in Basic, Intermediate, and Advanced Hatha Yoga, as well as in Stress Management, Raja Yoga, Meditation, Restorative Yoga, Yoga of Recovery, Children’s Yoga, and Yoga for People with Cancer. Lalita is one of Yogaville’s teacher trainers for the Basic and Intermediate levels, including Anatomy and Physiology. Lalita teaches children, adults, and senior classes along with Meditation and Stress Management classes. She has been invited to lecture at cancer retreats, to a community college and at UT’s Administrators retreats and women’s conferences. Lalita is a Reiki Master and licensed massage therapist specializing in Deep Tissue Massage and CranioSacral.